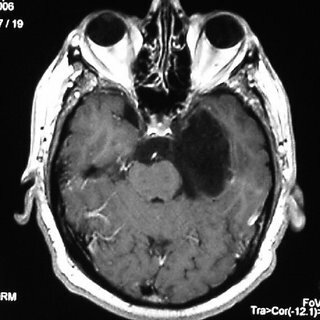 Intracranial epidermoid cysts, are rare congenital lesions originating from the ectoderm that constitute 0.3 to 1.8 % of all intracranial neoplasms 1) 2). Approximately half of these cysts are located at the cerebellopontine angle (CPA), although they can also be found in the parasellar regions, 4th ventricle, cerebellum, cerebral hemispheres, brainstem, and lateral ventricles. Intracranial epidermoid cysts, also known as primary cholesteatomas are considered to arise from epithelial inclusions at the time of neural tube closure or during formation of the secondary cerebral vesicles, and have slow growth rates resembling that of the normal epidermis 3). Pathologically, epidermoid cysts have well-circumscribed, irregular, thin walls with squamous epithelium lining. The epithelium undergoes progressive desquamation and keratin breakdown; therefore, the cystic contents include tissue debris, keratin, water, and solid cholesterol 4). These tumors are congenital and arise from displaced epithelial tissue between the 3rd and 5th weeks of gestation, when neural tube closure occurs. These brain lesions have an epithelial lining that encapsulates the tumor, which consists of desquamated epidermal cell debris. Most lesions are solid, but because the desquamated cells contain cholesterol some may have a liquid cystic center. The rate of tumor growth is gradual and linear, resembling the rate of human epidermis turnover, which is unlike the exponential growth of neoplastic lesions 5). see Intracranial epidermoid cyst diagnosis. The treatment of choice for epidermoid cyst is a total resection of the tumor. But sometimes total resection is impossible because of anatomical complexity. A conservative attitude in handling the tumor capsule is common given concerns about capsule adherence to neurovascular structures, and thus the possibility of recurrence is accepted with the intent of minimizing complications 6). Malignant transformation of an EC to squamous-cell carcinoma is rare; only 14 cases have been reported 7). Vaz-Guimaraes et al., from Pittsburgh, Houston, and Toronto retrospectively reviewed the medical records of 21 patients who underwent endoscopic endonasal surgery for epidermoid and dermoid cyst resection at the University of Pittsburgh Medical Center between January 2005 and June 2014. Surgical outcomes and variables that might affect the extent of resection and complications were analyzed. Endoscopic endonasal approaches may be effectively used for resection of epidermoid and dermoid cysts in carefully selected cases. These approaches are recommended for cases in which a total or near-total resection is possible in addition to a multilayer cranial base reconstruction with vascularized tissue to minimize the risk of intracranial infection 8). Kato K, Ujiie H, Higa T, Hayashi M, Kubo O, Okada Y, et al. Clinical presentation of intracranial epidermoids: a surgical series of 20 initial and four recurred cases. Asian J Neurosurg. 2010;5(1):32–40. Toglia JU, Netsky MG, Alexander E., Jr Epithelial (epidermoid) tumors of the cranium. Their common nature and pathogenesis. J Neurosurg. 1965;23(4):384–93. doi: 10.3171/jns.1965.23.4.0384. Alvord EC., Jr. Growth rates of epidermoid tumors. Ann Neurol. 1977;2:367–370. Aboud E, Abolfotoh M, Pravdenkova S, Gokoglu A, Gokden M, Al-Mefty O. Giant intracranial epidermoids: is total removal feasible? J Neurosurg. 2015 Jan 16:1-14. [Epub ahead of print] PubMed PMID: 25594324. Vellutini EA, de Oliveira MF, Ribeiro AP, Rotta JM. Malignant transformation of intracranial epidermoid cyst. Br J Neurosurg. 2014 Aug;28(4):507-9. doi: 10.3109/02688697.2013.869552. Epub 2013 Dec 18. Review. PubMed PMID: 24345076. Vaz-Guimaraes F, Koutourousiou M, de Almeida JR, Tyler-Kabara EC, Fernandez-Miranda JC, Wang EW, Snyderman CH, Gardner PA. Endoscopic endonasal surgery for epidermoid and dermoid cysts: a 10-year experience. J Neurosurg. 2018 Mar 1:1-11. doi: 10.3171/2017.7.JNS162783. [Epub ahead of print] PubMed PMID: 29547084.